People have been warned not to touch dozens of sheets of asbestos that have been dumped on cliffs near a seaside resort. 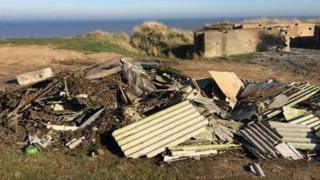 The hazardous asbestos was fly-tipped off Hogsea Lane at Hilston, near Withernsea, about four days ago, said East Riding of Yorkshire Council. The rubbish posed "a risk to members of the public and wildlife", it said. An appeal for information has been launched and a specialist contractor is being sought to remove the asbestos. A lorry or large van would have been needed to transport the asbestos, which is often found on older garage roofs. The council's enforcement officers are investigating and anyone found guilty of fly-tipping on this scale could face an unlimited fine or even imprisonment, it said. The waste was reported on Monday morning and is believed to have been dumped shortly before.